Where do you keep all of your children's science supplies? We were keeping them in the kitchen, but then it started to get weird. Having shaving cream and pipettes on Otis' kitchen shelves didn't seem right. It's easy to have these things placed around the home but because of my children's current interests, I like to keep them together, keep them well stocked and in one easily accessible place. So we've put together a little Children's Home Science Kit. You can start to put items together from toddlerhood, like shaving cream, pipettes and food colouring or bicarbonate of soda. The list is endless however if you know your children's interests it is possible to keep the basics on hand. When you have the basic materials already at home it makes science more accessible, it's easier to do, rather than going out and buying everything from scratch and it's easy to find everything in one spot. It has also helped to set limits on what materials the children can use if they want to make a volcano they need to use their own vinegar, if they want to raid our kitchen supplies they need to ask first. 〉Camera - this is optional, we don't always keep it in the science kit. A few other items to consider include a stopwatch, magnifying glass, rubber bands, ruler, craft sticks, small spray bottle, card, tape and safety goggles, There are a few materials that I keep out of the children's reach, however for the most part, the children can start setting up their experiments independently. Once the children are familiar with a few experiments they can look at the materials they have and start to explore and make up their own experiments. We also have a rule that you cannot eat (or drink) anything from the science kit, it helps to keep science and our food separate. I love this idea to give a book and children's DIY science kit as a gift. In case you missed it, you can find our list of favourite science experiment books for children here. We've been using a Sleep Balm to help the children settle and go to sleep at night. Otto (9 months) never liked the bath and bed routine, he finds it too stimulating. Otis (7 years) always needs time to the end of the day to process things, to clear his mind. Once the children are in bed I apply a little sleep balm on their pulse points and often on the bottom of their feet using a soft circular motion. It's such a lovely way to connect with them before they fall asleep. We've been using handmade but purchased Sleep Balm, I knew it was something that I could make myself. It was time to give it a go! There are a lot of recipes for Sleep Balm but I wanted one with Lavender and Chamomile that wasn't too complicated. Both Lavender and Chamomile are listed as oils safe to use on children from six months and are soothing and calming. Lavender and Chamomile also work well together. Melt the Coconut Oil and Beeswax. Mix the melted Coconut Oil and Beeswax together. Add the Essential Oils to the Coconut Oil and Beeswax mixture and stir. Pour the mixture into tins with lids and allow to cool. Label and date the tins. I used six of these little tins. The balm should last 12 months but I am certain we will use ours all up by then. These little tins of Sleep Balm would be a thoughtful gift for family and friends and are completely suitable for adults too. Qualities of the essential oils - Lavender and Chamomile promote calm and rest. Creates rhythm and ritual - children often respond well to external sleep cues and rhythm and rituals can help children feel safe, loved and secure. Makes an emotional and physical connection - touch from a loved one can alone be soothing, calming and healing. Is a soothing and caring practice - taking time for children shows them that we love and appreciate them. When using it for the first time, I applied a very small amount on Otto's foot and waited 48 hours to see if there was any reaction. This recipe can be halved and Coconut oil can be substituted with other known carrier oils. If you would like the Sleep Balm without the DIY I can recommend Badger Night Night Balm (Australia here) which been designed specifically for children (from six months). If you are tempted to increase the essential oils in this recipe keep in mind the recommended dilution ratio for children under two is .25% (1 drop per 4 teaspoons carrier oil). Hammering and Pounding Toys for the Montessori Baby, 10-18 months+. I'm starting to think about pounding and hammering toys for Otto (nine months) and I'm also starting to get some ideas for his first birthday! We have the Hammer Game with Balls (#3), c/o Manine Montessori). A few of my Montessori friends have used the Plan Toys Miracle Pounding toy (#5) and have recommended it to us. Otis used the Melissa and Doug Pound and Roll Tower (#9) in his Montessori toddler class and loved it so much we got it at home, he used it for almost a year, it was so worth the money. I'm also loving the look of Goki Hammer Ball Track (#7) and the Plan Toys Pounding Toy (#8). My boys have used the ball pounding toys more than their peg hammering toys but it's still something I'm considering for Otto. The benefits of hammering and pounding toys include hand-eye coordination, building arm strength, concentration and focus. We've found them a lot of fun too. Some of these (#1, #4 and #6) also assist with understanding object permanence. Let me know if any of these are your children's favourite! I'm loving anything thrifted, handmade or repurposed. 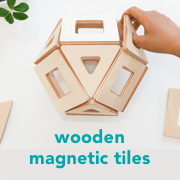 There are some lovely Montessori materials that I'm going to invest in but I like to DIY a few things too! Here are three DIY materials that we are currently using and loving with Otto at nine months. These are suitable with supervision once the infant is sitting, perhaps from 6-12 months+. Above is a ball tracker made from an egg rack (similar here). I've seen this used a few times in Montessori toddler rooms, but I can't find any examples right now. Unlike traditional tracking toys, the infant isn't tracking from side to side (building up those eye muscles) but is simply tracking the ball down the egg rack. It's a lot of fun and it's also good for coordination and concentration. We've used a repurposed egg rack (also known as an egg helter skelter) and some wooden balls. We simply put the ball at the top and watch it roll down to the bottom. Neutral, texture fabric squares. I made something similar for Otis here, but as I don't have my sewing machine with me I've used pinking shears around the edges. The idea is that the squares are all the same size and a neutral colour, allowing the infant not to be distracted by different colours and focus the textures. I've used fabric found around the home including felted wool, terry towelling, linen, cotton, brushed cotton and calico. Otto mostly takes these out and puts them back into the basket but occasionally you can see him softly feeling the fabric and running his fingers over it. Inspired by this post and these fabric squares. Similar can be bought and later used for matching. Sensory shakers. Again, I made similar shakers for Otis here. Otto loves rattles and these are fantastic as each shaker has a different weight, feel and sound. I like to use old spice jars as they are recycled materials and fit nicely in the young child's hands. Ours are glass but I feel like plastic spice jars would work too. I like to use natural items that aren't going to perish such as dried beans and pasta. What is important is that each jar is different. The nutmeg provides a solid clunky feel and sound while the little pasta pieces make a finer and softer sound and feel. At the moment I'm only presenting three jars at a time in a basket and rotating them when Otto loses interest! Otto likes to bang things together but doesn't like the sound and possibly the feel of banging these glass jars. You can superglue the lids closed for safety however, I only use these under supervision and will continue to reuse the jars. Montessori in the home - with three children! I was recently reading article about Montessori in the home and gentle parenting that left me feeling slightly unorganized, my house suddenly felt a little too messy, life a little too chaotic. After discussing this with a friend and also thinking about it internally, I realized there was something wrong with this idealized picture of how life should or could be. I have no doubt the author was authentic but her life is different from mine in one major way - this family has one child. We have three children including an infant. I remember how easy it was to 'follow the child' when you have one child, or even two. How easy and simple it is to create a family rhythm or to design cozy but creative spaces. Life gets complicated when you are trying to meet the needs of three children. So as my youngest is reaching the crawling, climbing, grabbing (hair pulling, putting everything in the mouth) stage I wanted to share with you the frustrations but the joy of Montessori in the home with three children. Here are a few ways that we make it work. Safety always comes first. Some Montessori materials have small parts or even some project work has choking hazards, in our home these types of things including Lego stay in the older boys rooms, but even then they are stored on a desk or shelf, not on the floor where they are easily accessed by our crawler. Order is still important, everything has its place. Each child has their own retreat area. All three boys have their own rooms and each has a comfy area with cushions and a soft blanket to read, for the older boys to use their iPads, without interruption. We have defined communal, shared areas for working, reading and relaxing. This is difficult as we don't have a playroom but is possible using our lounge/living area. It's important that children learn to interrupt. This is something my boys have learnt in (Montessori) school and it's something we carry over at home - when the boys want to interrupt they will wait next to me and put their hand on my shoulder. As soon as I'm ready I will then help or address them. Unfortunately, this doesn't work for an infant. Accept that it is difficult to follow the natural rhythm of an infant when you have others to tend to, it's not just about waking the baby for school drop-off or pick-up it's about having to prepare food for others, sporting activities, or assist with other children's bedtime. We follow the child's natural rhythm as much as possible but when it comes to a sleeping baby or nap time, we juggle as much as we can, routine helps. Keep chores age appropriate. When we have older children I think our expectations on the younger children change, we can start to expect too much of them. It's important to keep our expectations in check and make sure that chores or tasks are always age and developmentally appropriate. The more children I have the more I appreciate how important order is, to the child and to the adult. As much as possible we create home environments that have order, everything has a place and within reason is returned to that place. We appreciate the opportunity to teach empathy within the home. Of course it's possible to do this if you have one child but having more children in the home provides more opportunity for teaching and experiencing empathy. Use the Montessori concept of the Peace Table. The Peace Table looks different for every (Montessori) school and classroom but it's essentially a space or a table where (usually) two children can come together to resolve conflict, this can also work in the home. A Peace Table isn't a constant in our home but was important a couple of years ago when it felt like my children were constantly at each other. Finding one-on-one time is difficult when you have an infant, nap times can be unpredictable. I find my children appreciate having time with me with our infant, but without their other brother present. So although our infant is still with us, they are the center of attention or we do something special or more relevant to them. I also stagger bedtime by 10-15 minutes with my older boys so I can usually spend a few minutes with each one to decompress or just chat before bed. As best as I can I try to understand the developmental needs of each child. This can be achieved by observing them but also by attending parent education nights when possible and by reading texts relevant to their ages/stages. Allow and encourage children to help each other. This is the big advantage in having more than one child. It doesn't necessarily mean the older one helping the younger ones, it's about helping when the opportunity arises, the younger ones can look for those opportunities too. Have older children role model for the younger children, in a positive way. This will happen naturally but can be particularly useful if there is something you are working on like grace and courtesy. Allow and encourage the older children to assist and guide the younger ones, just as would occur in the Montessori classroom. Often it's easier to learn from a peer. Children's hands are smaller, their language is similar. You can read more about this in my previous article Why Montessori has multi-age classrooms (and why siblings often learn best from each other). Allow the children to inspire each other, the younger ones can see what is ahead for them be it going out, school camp, Great Lessons. Although they may not share the same interests (think project work, sports, books), they can learn from each other's interests. When you are busier, have less time and fewer resources you are required to think about what is important, what is important in your Montessori home, it helps you to focus. It is also possible to take advantage of having more children in the home, they are able to help and assist each other, we know that children learn best from each other! We don't need to provide a lot of activities to promote gross motor development, it really comes naturally to the child and they will find things in the environment to support them. But it is important that we provide a safe environment and sometimes that means giving them things to climb up on rather than them climbing on unwanted things like chairs or tv cabinets. It means that we need to provide an environment that supports movement. A lot of families will provide gross motor activities outdoors but there is no reason it can't be done inside too. Allow for climbing on stairs. We don't have a gate on the bottom of the stairs so we allow Otto to climb them. He recently made it up four stairs and it was wonderful to watch his achievement. We only allow him in this area when we are available to directly supervise him, he cannot at this stage get down safely and will slide down. Montessori classrooms often have the steps for children learning to walk, while it isn't possible to have this in the home, climbing stairs (while supervised) can have huge benefits. Inside and outside we love a good obstacle course with a tunnel. Crawlers will often love crawling over pillows or cushions and through obstacles. Provide a steady and sturdy walker wagon. This is a loved item in our home. Otto is only taking a few shaky steps with it but he is pulling up on it all the time. He also loves to ride in it while his brothers push him around. This one has been loaned to us by a lovely friend. The playground might not be an obvious place for an infant but it provides a lot of opportunity for gross motor skill development. Pikler Arch (ours is c/o Wiwiurka). As we have decided not to install a Montessori style pull up bar, this has been an excellent alternative. We've had it in Otto's movement area for a couple of months, he reaches for it when he wants to and easily pulls up on it. He is reaching for higher bars but hasn't started climbing or stepping up on it. Otto also climbs through it, hides under it, I cannot recommend it highly enough. Ball play. Because I have older children we have a lot of sports balls in the house. Otto is absolutely loving rolling a larger, in this case a basketball. It only took him a few minutes to work it out, we sit facing him with our legs out and roll the ball to him and he rolls it back to us. A ball basket with smaller balls is also excellent for the crawling infant. We allow cruising on furniture such as our couch and ottomans. Otto also enjoys walking around supported by our step stool and a friend recently recommended using an upturned laundry basket. Provide child-size furniture such as infant low shelves, weaning table and child-size chairs for pulling up on and sitting at. In the mornings Otto will often spend 15-20 minutes practicing getting in and out of his weaning chair. Our large ball tracker (if you are in the US, we love this one) encourages Otto to stand to put the ball in and then kneel down again to get the ball from the drawer. It has also taught him at a rather early age to pull the drawer in and out. Wheely Bug Bee. These are designed for an older child to sit on them to ride but my children have also enjoyed pushing them around while crawling and later while standing. We promote movement wherever we go. Otto spends most of his day crawling around the house exploring. Clothing that promotes free movement is important too and Otto is barefoot as much as possible which really helps with climbing. Above image is adapted from "Give me space and give me time" - the pedagogy of Emmi Pikler using the example of the SpielRaum for Bewegung. 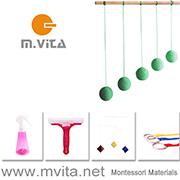 Pictured above is a Psycho-sensory Motor Development Chart, Birth to Three from Voila Montessori adapted from Centro Educazione Montessori. Beautiful, kind, full of joy. Gentle, often with soft and muted illustrations. Designed to encourage the imagination and to nourish the child's sense of delight in the natural world. Many are wordless which helps to develop storytelling in young children. Feature familiar elements for the child such as common animals that the child may have seen in person and daily activities relevant to the young child such as household activities and observing the seasons. A New Day - This is a wordless book that takes you on a journey through the day of a child in a Waldorf home, but what could just as easily be a Montessori home. It contains illustrations of the young child waking up, going for a walk and feeding the ducks, making meals, and enjoying a bedtime story before going to sleep. Rain or Shine - This is also a wordless book that takes the child through the seasons. This can be through observing the trees, the weather, the clothing and the activities the children are involved in. Through The Seasons - This is a unique book as it is a compilation of artwork by Sarah Laidlaw, an Australian artist. If you enjoy Sarah Laidlaw's artwork including cards, you will enjoy this book. It is wordless and takes you through the seasons. Includes a few hints that these scenes are from Australia including Australian birds. These images are very soft and dreamy, they will not appeal to all families. There are a few families scenes which is nice, rather than focusing on the child only, some of the illustrations are of families, gardening or going for a walk/hike as examples. Hello Farm, How Do You Do? - I love this whole series. As we are now living in a rural area my children see many of these animals on a daily basis. The text is rhyming and fun to read. This is a good book for discussing the sounds that many farm animals make. The illustrations are lovely. Hello Birds, What Do You Say? - This is similar to Hello Farm in that it goes through the sounds that different kinds of birds make. It is excellent for introducing the child to the names of common birds, the illustrations are clear that it would also help the child learn to identify the birds. If you are in Australia most of these board books can be found at Honeybee Toys. Montessori schools and families generally do not present fantasy based books and stories to children in the first plane of development (birth to 6 years) so it's important to read new books before presenting them to the child. Why we love worldless picture books and Why should you read worldless picture books? By Floris Books, publisher of Steiner-Waldorf education, parenting and children's books.